1 2 3 4 Ritchie, William A. (1989). 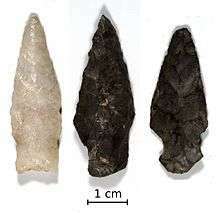 A Typology and Nomenclature for New York Projectile Points (New York State Museum Bulletin Number 384). Albany, New York: The University of the State of New York, The State Education Department. ↑ Fogelman, Gary (1983). Lamoka Type and the Small Stemmed Point Tradition (Pennsylvania Artifact Series, Booklet 14). Fogelman Publishing.